As an example for a bigger project could be the donation of the so-called CuddleCot for a hospital in your area. This gives you a target amount of fundraising and the donors a concrete idea where their donation goes to. After a baby has passed or after it has been born still, parents also have to face the difficult fact that their time with their dead baby is limited because, after a while, the body will start to change. With the CuddleCot cooling pad system by Flexmort parents get more time with their baby – the biggest gift you can get at this point. 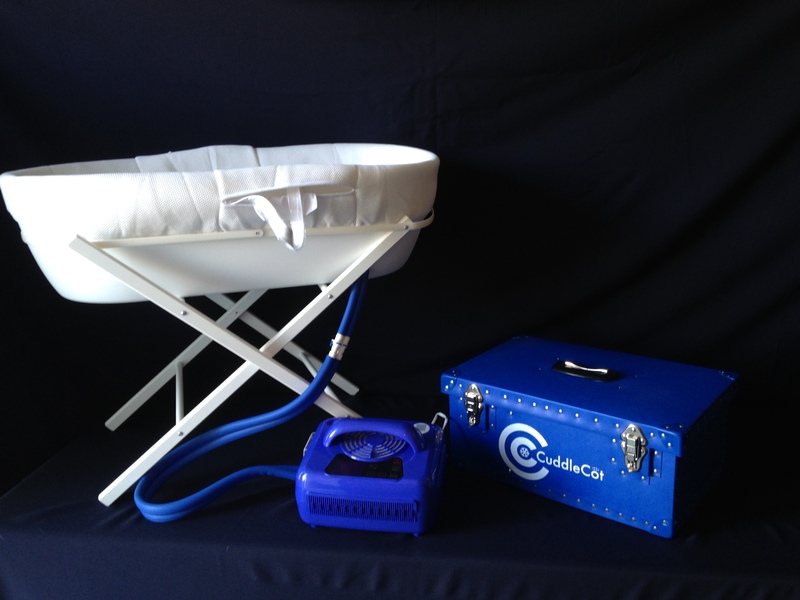 For more information on the CuddleCot, visit Flexmort’s website. A CuddleCot comes with costs of approximately 3.000USD and will be ordered and delivered directly from Flexmort. You might want to donate the CuddleCot to the hospital where your baby was born or you look for one which attracts you for other reasons. There are hospitals which specialised on high-risk pregnancies or premature babies so they might have a bigger need for a CuddleCot than others… However, this decision is individual and should feel right for you. Get in touch with the marketing director, this is a good and safe start who to address and present your project and the CuddleCot and discuss further steps. When it comes to a meeting, take along information material about the CuddleCot, be ready to speak about your story and your project in honour of your child and explain why and how this tool will help parents. Explain the usage and importance of it. After that, further planning will go hand in hand with the hospital and depend on their internal guidelines. Some hospitals might be inspired by the idea and might be willing to either self-found a CuddleCot or donate to your fundraiser. Work together to find the best solution for both of you. Some hospitals have a bereavement manager who would be the go-to person if you want the hospital to fully fund a CuddleCot. The CuddleCot is ordered directly from Flexmort. Simply e-mail them, a sales representative will contact you and will lead you through the purchase and payment process. It takes about 3-5 days to complete the purchase and another 1-3 weeks to deliver. Therefore please don’t set a placement date at the hospital until you have the CuddleCot in your hands as customs might delay the process. Once you have the CuddleCot, arrange a donation day with the hospital. It is up to you if you want to simply come by to hand it over or if there should be a small ceremony. Just do what seems right for you and arrange it likewise with the hospital. Beforehand you might also decide whether to put a special plate on the CuddleCot to say that it is in honour of your child and maybe stating your project. A simple sticker might do it as well or you leave it as it is and donate it. If you go for a small ceremony, there will preparation necessary you will do in cooperation with the hospital. You might want to present your story, your project and bring along your closest family for that. It’s also a good opportunity to explain how the CuddleCot works. Some donations like that have been covered by local media – think of that too as well as if you want that and make arrangement together with the hospital. After all, media coverage makes your project and the CuddleCot known to a bigger audience and means more awareness about pregnancy and infant loss as well as the importance of time in case of loss etc. Donation day will for sure a big and maybe nerf-wrecking day for you. Going back to a hospital, talking about your child, maybe showing pictures is an emotional thing to do and might seem overwhelming. There might be triggers so self-care is important for this day. And think of your goal: Honouring your child and helping other parents who have also lost their beloved child. This should provide you with a very rough overview of how to donate a CuddleCot. If you have questions or additions, please comment below or send an email!